The Fashionline Panel Glide system is a modern, innovative option for large windows, sliding doors and bi-fold doors offering protection from the sun and privacy from the outside world. The beautiful wide fabric panels reflect the popular minimalist decorating style, are easy to operate and can be quickly moved out of the way when you need to clean. The system includes flat fabric panels attached to a trouble-free head rail system using roller-mounted carriers that make it very lightweight and easy to operate. The innovative installation options provide versatility and flexibility. The range of fabrics and colour options means you can choose from block-out, translucent and sunscreen fabrics for maximum protection from the sun. A new, modern approach to window furnishings with sideways easy glide operation. 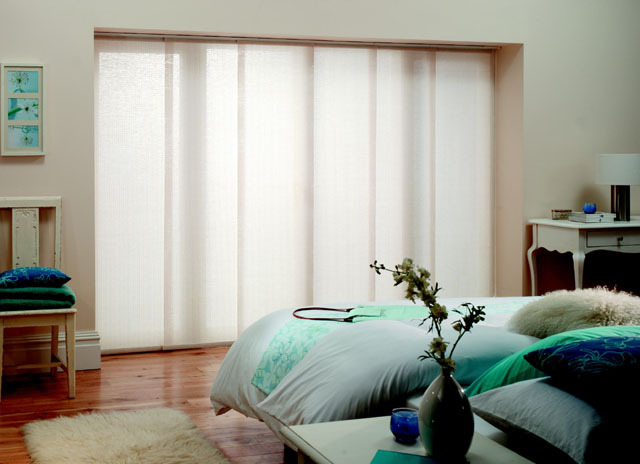 Panel Blinds can be the answer to anyone wanting to upgrade from the lesser cost window furnishing. Most popular as an option on sliding doors because of the sideway stacking action. Available in a range of fabrics and different trims.